Keeping it simple is my theme for this year. At least that's what I said in January before the house was on the market and I had to make a couple quilts in two weeks. I don't do a lot of decorating for the holidays. I don't have a ton of space and I DON'T like clutter. But I do have a grapevine wreath I like to hang on my front door. I put different things on it for each holiday. I find it's a lot easier to have one wreath and a bag full of changeable decorations instead of 12 different wreaths and nowhere to store them. This is the first year I've ever had something for St. Patrick's Day on my door. You know, you just can't find wooden shamrocks anywhere. I made mine out of felt. I would have liked to use a thicker ribbon but sometimes you have to use what you can find. 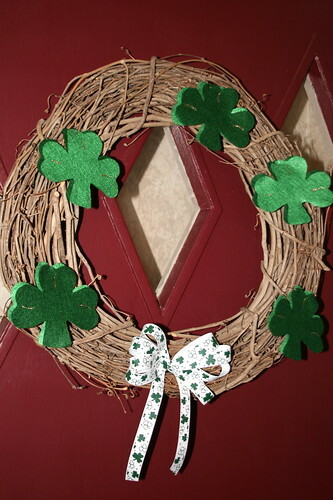 I hope this wreath brings us a little luck this month. I suppose it won't bring a lot of luck since I didn't make a four leafed clover. Oops.